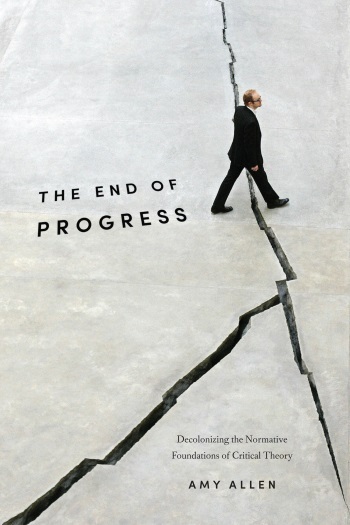 While post- and decolonial theorists have thoroughly debunked the idea of historical progress as a Eurocentric, imperialist, and neocolonialist fallacy, many of the most prominent contemporary thinkers associated with the Frankfurt School — Jürgen Habermas, Axel Honneth, and Rainer Forst — have defended ideas of progress, development, and modernity and have even made such ideas central to their normative claims. Can the Frankfurt School's goal of radical social change survive this critique? And what would a decolonized critical theory look like? Amy Allen fractures critical theory from within by dispensing with its progressive reading of history while retaining its notion of progress as a political imperative, so eloquently defended by Adorno. Critical theory, according to Allen, is the best resource we have for achieving emancipatory social goals. In reimagining a decolonized critical theory after the end of progress, she rescues it from oblivion and gives it a future. Amy Allen is Professor of Philosophy at Pennsylvania State University. She is the author of "The Politics of Our Selves: Power, Autonomy, and Gender in Contemporary Critical Theory" (Columbia University Press, 2007). See her paper "Adorno, Foucault, and the End of Progress" (pdf). And a video of her presentation of the paper at George Mason University (March 2014) here. See also her paper "Normativity, Power, and Gender: Reply to Critics" (pdf, 2014) - a response to the critiques of her book "The Politics of Our Selves". Who ought to do what, and for whom, if global justice is to progress? 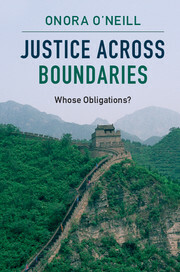 In this collection of essays on justice beyond borders, Onora O'Neill criticises theoretical approaches that concentrate on rights, yet ignore both the obligations that must be met to realise those rights, and the capacities needed by those who shoulder these obligations. She notes that states are profoundly anti-cosmopolitan institutions, and that even those committed to justice and universal rights often lack the competence and the will to secure them, let alone to secure them beyond their borders. She argues for a wider conception of global justice, in which obligations may be held either by states or by competent non-state actors, and in which borders themselves must meet standards of justice. This rich and wide-ranging collection will appeal to a broad array of academic researchers and advanced students of political philosophy, political theory, international relations and philosophy of law.